The chief proposals include gun-purchasing restrictions for those on the FBI terrorist watch list and expanding background checks for gun buyers. Cornyn’s proposal would put a 72-hour hold on gun purchases for people on the terror watch list. Federal officials would then have to prove why the purchaser shouldn’t be allowed to buy the firearm. The shooter in the Orlando rampage, Omar Mateen, had been on the FBI terrorist watch list for 10 months before being removed. 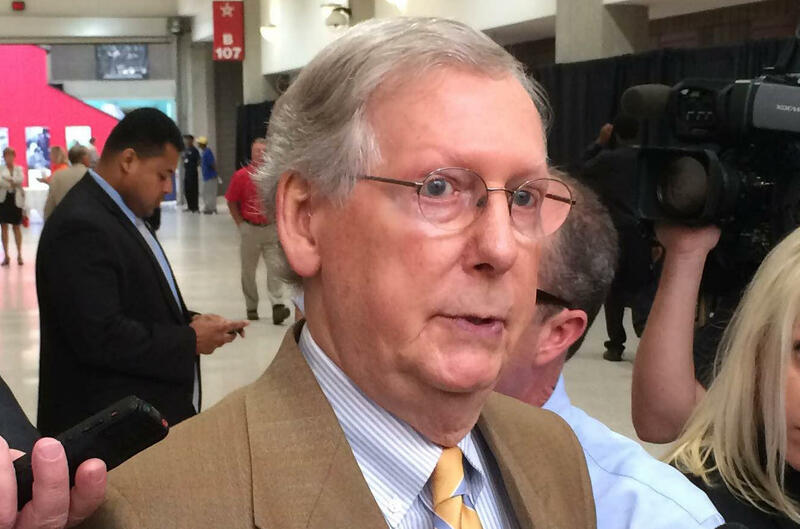 U.S. Rep. John Yarmuth, a Louisville Democrat, said he was “pleasantly stunned” when he heard McConnell say he was considering some form of gun control measure. Yarmuth supports the terrorist watch list/no-fly list restrictions, expanding background checks and a ban on assault weapons. Sen. Rand Paul, a Republican, previously supported Cornyn’s measure to have courts review gun purchases by those on the terrorist watch list for 72 hours when it was proposed as an amendment to a bill to repeal the Affordable Care Act last year. Paul opposes government surveillance policies like the bulk collection of cell phone data by the National Security Agency. On Wednesday, Paul’s Democratic opponent in this year’s Senate race, Lexington Mayor Jim Gray, accused Paul of voting to allow those on the terrorist watch list to continue owning guns. Gray challenged Paul to take up the terrorist watch list “loophole” and prevent those with mental disabilities from owning guns. Meanwhile, the rest of Kentucky’s federal delegation was mixed on whether to pursue gun control legislation. U.S. Rep. Ed Whitfield, a Hopkinsville Republican retiring this year, does not believe in increased gun control measures, according to his spokesman. U.S. Rep. Andy Barr, a Lexington Republican, said that the country needs to enforce existing laws and better maintain the terrorist watch list, which he suggests Matteen should have still been on. U.S. Rep. Brett Guthrie, a Bowling Green Republican, similarly questioned why Mateen was removed from the FBI watch list, and he cautioned against limiting gun rights. “I am a supporter of protecting Second Amendment rights, and we must be careful not to take actions that would restrict the freedoms of millions of law-abiding Americans,” Guthrie said. Rep. Thomas Massie, a Lewis County Republican, did not respond to a request for comment, though his press secretary pointed to recent posts on Massie’s Facebook page criticizing Democrats for pushing for gun control legislation after the shooting. “As usual, the gun control being proposed is unconstitutional and would not have prevented the tragedy that the legislators seek to use to motivate its passage,” Massie wrote.